Bitcoin #CAC40 #Japan Wonder if this would crash or just do nothing, ever again, if renamed BRITcoin? Our distrust of Bitcoin remains as strong as ever, though the fake currency is starting the exhibit some interesting potentials for the longer term. Or given the speed it can sometimes move, anytime soon! For us, the key number against Bitcoin is now at 5398. Essentially, if it closes a session above such a point, we can extrapolate coming recovery to an initial 6034. If exceeded, our secondary calculates at 7496 but before considering such, it’s worth dwelling on the visual implication at 6034. Such an ambition virtually matches a plateau achieved during 2018 with the inevitable suggestion any rise shall find a glass ceiling awaiting at the 6,000 level. 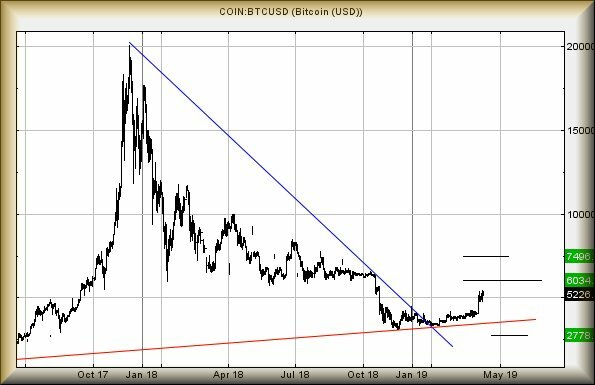 Remaining on the subject of visual implications, it appears the price of Bitcoin has successfully extracted itself from the ruling downtrend and now, appears to be making an effort. However, there is the RED line across the bottom of the chart, presently at 3485. Concern would be justified with weakness below this level, now signalling the potential of travel to 2778. In itself, not particularly alarming as the entity would need trade below 2035 to justify outright panic. At present, 2035 signals our “ultimate” bottom for Bitcoin, this being the level we cannot calculate below. Absolutely nothing suggests this is a risk. For now, anyway!